Shipping address if different from billing address. Leave blank for studio pickup. Refunds are given if a student is unable to continue attending a series due to injury or family-related emergency. The refund must be requested before the first half of the series has been completed. A $15 processing fee will be applied to all refunds. Contact Annie. Missed classes can be made up by attending any other class offered DURING THE SAME 5- or 8-WEEK SERIES. If class was cancelled, fee/class payment can be carried into the next series, or you can attend any other class offered DURING the same series, or you can request a refund. For unlimited card students: if classes are cancelled due to weather, your class card can be extended for the number of days that classes were cancelled. Arrive five minutes before class begins. On your first visit to the studio, please arrive ten minutes early. 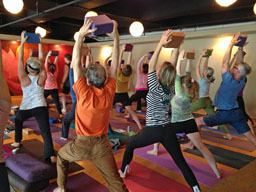 The studio provides all yoga props: mats, blocks, bolsters, straps, etc. You're welcome to bring your own. We have limited scholarship funds and work exchange opportunities. We will do everything we can to welcome all motivated students regardless of ability to pay. Contact Annie. Two Dog is a wonderful community and the teachers are holistic in their teaching styles. In a class you will move, laugh, contemplate, stretch, strengthen and be still.